Oxygen Therapy Equipment contains control panel, angle mount, and bag mount, ether unit which are fabricated using high quality raw materials and are offered in competitive prices. Medical equipment is designed to aid in the diagnosis, monitoring or treatment of medical conditions. These equipments are made in accordance with the international quality standards. It is well-known for its efficiency and user-friendliness. These equipments are widely used in Hospitals, Nursing Homes and Health Care Centers for different applications like operations, surgery and treatments. Being the reckoned names in the industry, we offer varied range of Silicone Resuscitator that are manufactured as per the set quality standards and is used in varied medical applications. Our entire product range have smooth surface and are safe to use. They are non-toxic in nature and delivered as per the exact preferences of our client. Available in non-toxic, medical grade PVC material finish, these Transparent Low Pressure Tube options are clear in construction as well as soft and smooth in usage.Further, these come with high volume, low pressure cuff for superior sealing support throughout ventilator cycle. Some of its features include use of thermo sensitive PVC that allows softening of tubes at body temperature to provide best match with airway anatomy, tube coming with visible markings for easy observation, available in complete range of standard sizes, availability in sterile, disposable and individual packed finish, offering optimum support for oral intubation and others. In order to cater diverse requirements of the clients, we offer varied range of Disposable Silicone Airways that are delivered in varied thickness and dimensions. We manufacture the entire product range using quality assured raw components using latest tools and advanced technologies. Disposable Silicone Airways are acclaimed among the client for optimum quality and high strength. 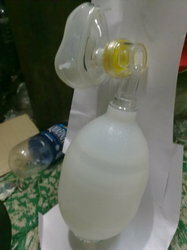 Providing support in resuscitation process, these Ambu Bag - Adult provide for high response action with little mechanical resistance. Further, its precise designs provide for optimum usage in terms of stroke volume and recoil. Some of its features include providing for secure gripping support, lightweight design that makes it easy to handle ventilation process, faster recoil time allowing for rapid ventilation, advanced single-shutter valve system for reliable functioning, thin-walled compression bag allowing for precise usage and low valve resistance for consistent airflow support. Developed using soft, non toxic PVC, these Twin Bore Nasal Cannula options provide for non irritating usage even when used for longer time periods. Coming with soft twin nasal tips to offer equal and consistent oxygen volume to air passages, its smooth finish as well as adjusting option of nasal tips also makes these highly suitable for usage. 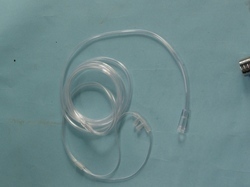 Some of its features include providing for maximum comfort to patients, funnel shaped connector support for facilitating easy connection to oxygen source, sterile and disposable finish, allowing efficient administration of oxygen, available in tube lengths of 200cm as well as in sizes for adult, pediatric & neonatal usage. Looking for Oxygen Therapy Equipment ?